If my organization is hosting a co-sponsored event (e.g. Swaps, collaborative social/philanthropic events, etc.) do both groups need to submit an event registration? No. When filling out the event registration submission via the calendar feature of Forum, the RSO completing the submission can list other RSOs who are also sponsoring the event. For more information about how to co-sponsor an event within the Forum, check out this link. Our 15-business day deadline is coming up soon, and we don’t have a space booked. Can I still submit an application? Yes! If you do not have a space booked, verified, or confirmed but have an idea of where you would like your event to be hosted, submit the event registration submission with that information. RSOs must meet with University Police for numerous reasons. Namely, if your event has potential to have significant high-risk elements, a UPD security consultation will be required. UPD address specific areas of concern and will allow you to ask questions about how to ensure your event is both safe & successful. What do you mean by ‘Amplified Sound,’ and how does it get approved? Note, the University’s Amplified Sound policy is designed to monitor and regulate amplified sound outdoors on-campus only. My RSO wants to host a race/walk/5k. How do I make that happen? First, you will need to submit an event registration submission. Many RSOs will want to start their race/walk in the Grove, so you will need to book the Grove & Grove Stage through the Office of the Student Union. You will need to meet with UPD to plan out a route as well as with Parking & Transportation to coordinate alternate routes for the OUT Busses. Depending on what the event will look like, you will also be asked to connect with Landscape Services and Facilities Management. Because coordinating an event like this is complex, it is highly recommended that you begin by submitting your event registration submission a full month in advance prior to the event taking place. What are the possible routes for walks/races/parades across campus? There are four possible routes your organization can utilize to ensure the safety of our community, the following routes are available for walks and runs. These routes take into consideration the time of day and week, traffic concerns, and construction around campus. Something has come up, and we will need to change the date of our event – can we do that without any penalties? Absolutely. OLA is happy to work with your RSO to find a new date that works for both you and our campus partners. For a “pending” event registration submission, simply comment on the submission requesting a date change. OLA will then “deny” the event registration submission so that you can made any edits to the original submission. If you want to cancel the event after the event has been “approved,” simply “manage the event” and click “cancel.” OLA will make note of cancelled events with appropriate University departments. What do the various “visibility” options mean? How can we track event attendance? First, you will need to have the proper equipment to scan student id cards – Magnetic Card Swipe Readers. Please find this webpage and to access information on purchasing Magnetic Card Swipe Readers. 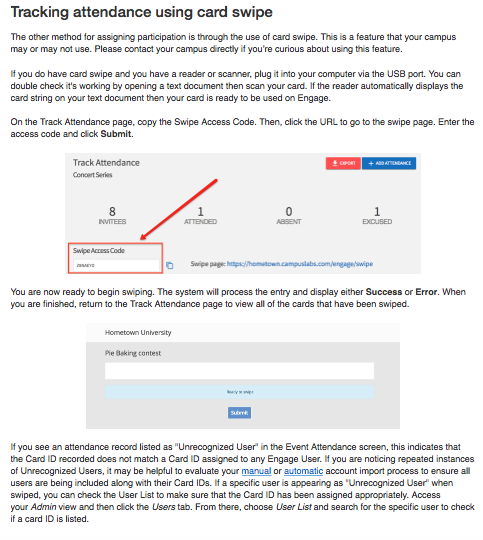 Second, you will need to manage “tracking event participation.” For step by step instructions on how to do so, click here.